West Cork (Irish: Iarthar Chorcaí) refers to a geographical area in south-west Ireland, lying within Ireland's largest county, County Cork. Traditionally a popular tourist destination, the area is seen as being distinct from the more populated northern or eastern parts of the county, as well as the more urban area of M etropolitan Cork. Those from this quite rural part of Ireland often describe themselves as being from West Cork. 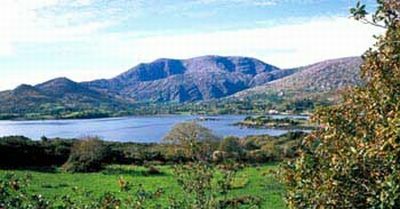 The area is famous for the rugged beauty of its peninsulas (such as the remote Beara Peninsula, Sheep's Head and Mizen Head peninsulas), popular beaches such as Inchydoney, Owenahincha and Barleycove, and picturesque towns and villages such as Skibbereen, Clonakilty, Kinsale and Rosscarbery. Road signs may be found around Cork city and elsewhere directing traffic for "The West", or "West Cork". The town of Bandon is described as the "Gateway to West Cork". Both Carrigaline and Macroom are also seen as key gateways to the region. The area of West Cork is not strictly defined, but at its broadest definition it includes all parts of County Cork south and west of the River Lee with the exception of Cork city and suburbs. The area is notable for having been linked together by the Cork, Bandon and South Coast Railway, which began in Cork City, travelled across the county, with branches to Clonakilty (junction at Gaggin) and Skibbereen (junction at Drimoleague), before terminating at Bantry. The closure of the railway is still a grievance for many in the area. The narrow gauge Schull and Skibbereen Railway closed in 1947. Nowadays the main infrastructural backbone is provided by the N71 and R586 routes. A large part of the area is contained within both the Catholic and Church of Ireland Dioceses of Ross. These Dioceses no longer exist separately but are part of the larger Dioceses Cork & Ross (& Cloyne in the case of Church of Ireland).